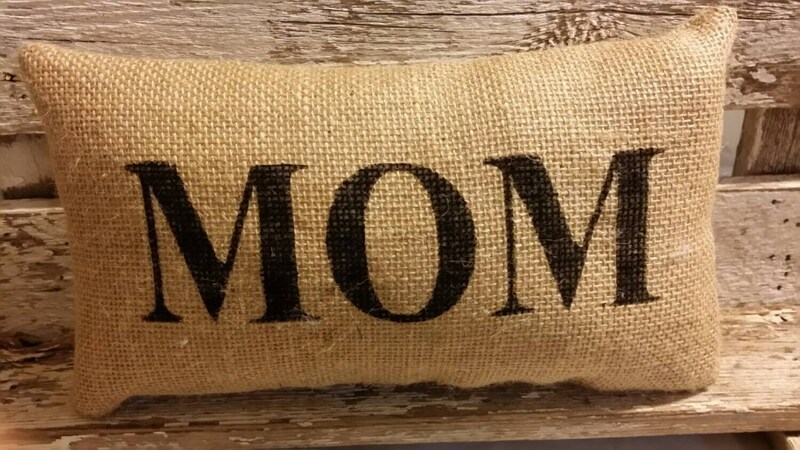 Burlap Mom 11" x 6" Pillow is made with a high quality burlap and lined with cotton muslin. I have lined this pillow so that no white fiberfill shows through your pillow, this gives your pillow a very sturdy feel. Perfect Gift for Mother's Day or Birthday or just to say I Love You Mom! What a cute way to let your Mom know how much you love her, she will feel your love every time she sees this pillow. Pillow measures approx 11" x 6"
Please contact me within 3 days of receiving your purchase and I will try to resolve the problem or issue you a refund. I do not issue a refund for Custom Orders, I make your pillow exactly as you request per the emails I receive prior to making the pillow for you. Since it is a Custom Pillow I cannot resell it. I spend a substantial amount of time producing your custom pillow therefore I cannot issue a refund. postage and shipping the item back to me is the buyers responsibility as soon as I receive the item I will issue you a refund minus the shipping fees. I do not refund the shipping fees on any item. Orders are taking up to 10 Business Days to ship and Custom Orders may take a little longer. Email me for a time frame on custom orders. If you need your sign sooner please contact me first and I will see what I can do for you.